You are here: Home » Where Do I Start? 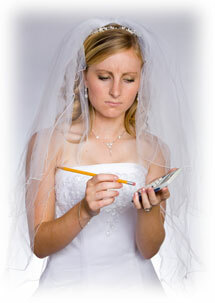 I have so many questions about planning my wedding... where do I start? We recommend that you contact as many entertainment vendors as possible. Ask them every question on your list. Use these questions to add to or even create your own personal interview list. Please add any questions that you feel are important! Who will be the contact person for my event, and what is their contact number? What percentage of your business is dedicated to my type of event? How many staff members are working with your company? Do the staff members assigned to my event have references? Can I contact them? What happens if my DJ is sick the day of my event? Do you have backup equipment available if your equipment has problems at my event? Do you have a corporate policy regarding your staff drinking alcoholic beverages at my event? Do you specialize in any specific types of music? Is your music library licensed or illegally acquired? Do you specialize in any specific types of events? What type of sound system will you provide at my event? Are you able to act as a master of ceremonies if I require an "M.C."? How will your staff be dressed at my event? Do you provide a light show? Do you have pictures I could see to help me decide on a lighting package? Do you provide a cordless microphone? Do you take breaks? If so, how many and how long are they? What is your base fee for an event, and what does that include? Is overtime an option the night of my event? What is your cost for each additional hour of overtime? Can I book overtime in advance at a discounted rate? What are your payment options and cancellation policy? Take notes, meet with company representatives and check their references. Take time to find answers to all of your questions.